Natalie Swanston has married Simon Fuller. The 30-year-old interior designer married the 48-year-old music manager of the Spice Girls in Napa Valley, California on May 30, 2008. In attendance at their wedding were 70 guests, including Spice Girls Geri Halliwell, Victoria Beckham, and Emma Bunton. The couple exchanged vows and rings under an oak tree as the sun set. 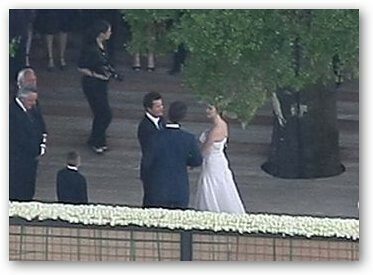 The $4 million wedding ceremony of Natalie Swanston and Simon Fuller was only the start of a 3-day celebration. The wedding dinner was provided by Thomas Keller's The French Laundry and followed by accommodations at the Auberge du Soleil, a luxurious $5000-a-night hotel. The DJ was Samantha Ronson, who is Mark Ronson's sister. Other guests who attended were supermodel Claudia Schiffer and singer Annie Lennox. Simon Fuller created "American Idol" and is the manager of many successful celebrities and stars. "Time" named him on of the 100 Most Influential People in the World in 2007. Interestingly, there are rumors that Natalie Swanston's new husband once dated Spice Girl Emma Bunton.